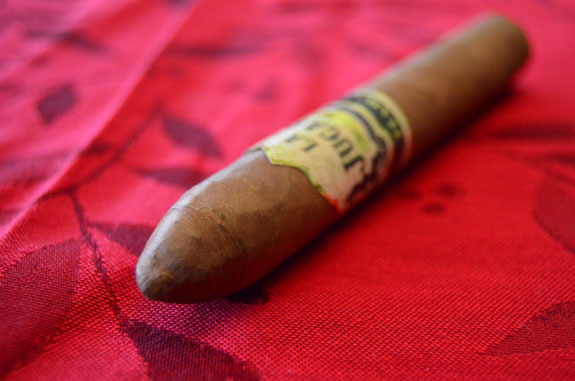 Earlier this year, I had an opportunity to try out the La Jugada Prieto by Moya Ruiz Cigars. I was extremely surprised by how much I enjoyed the cigar. It is actually one of my favorite San Andres Maduro cigars, right behind the Undercrown and Ortega Serie “D”. In my review of the Prieto (See the review here), I mentioned that the Habano version of La Jugada was scheduled to be released at the 2013 IPCPR Trade Show. 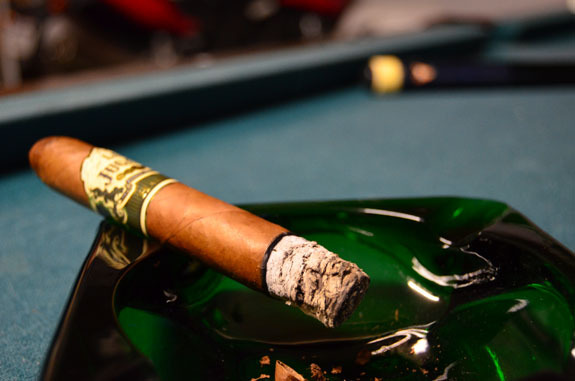 Danny Moya and Nelson Ruiz held true to their word with the release of the cigar in July. Like the Prieto, the Habano is produced at La Zona, Erik Espinosa’s factory in Esteli Nicaragua, and is available in the same five vitolas – Robusto (5 by 50), Toro (6 by 52 ), Belicoso ( 6 ⅛ by 52), Double Corona (7 ½ by 49), and Ancho (6 by 60) . 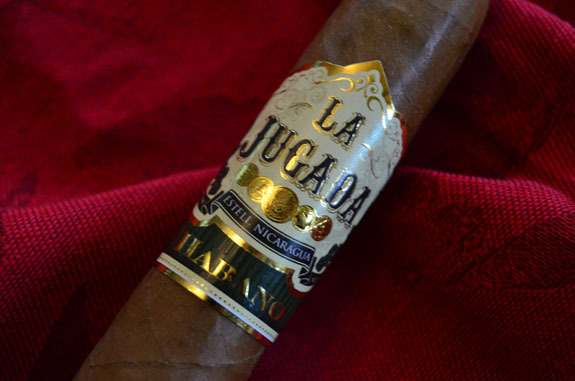 La Jugada Habano derives it names from the Ecuadorian Habano wrapper it utilizes in place of the San Andres Maduro on the Prieto. The binder and filler tobaccos remains the same as the Prieto. Smoke Time: 1 Hour and 30 Minutes. 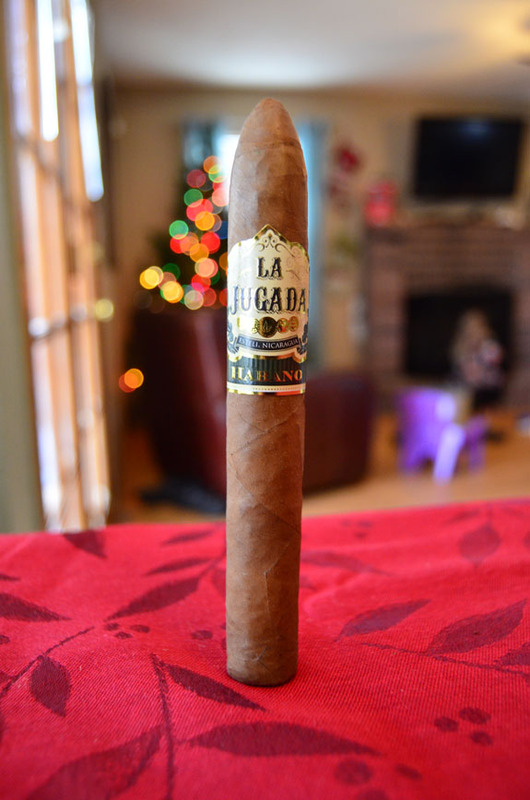 The La Jugada Habano wears a tan colored wrapper that has a light oily sheen. The tan wrapper does nothing to hide the veins that crisscross down the cigar, as well as a fine tooth and several bumps. Do not get me wrong, this is not a bad thing. I love seeing the natural character of a leaf that can be hidden on darker wrappers. The Habano is firmly packed through and through. The aroma off the wrapper is very light, with mainly tobacco and cedar notes, while the foot shows off dried fruit and chocolate. Clipping across the tapered head, I find a decent draw. Depending on smoke production, I may need to make an additional clip, which is of no worry because I have plenty of play room. My lips have a slight spice sting and the cold draw presents wet earth notes, more dried fruit flavors, and some sweetness. The initial flavor is of grass which is quickly met with a spice that is warming my mouth. As I smoke deeper into the first third, some toasted bread-like notes, cedar, and sweetness enter the mix. A good amount of heat is felt in my mouth but the profile is not overly peppery. 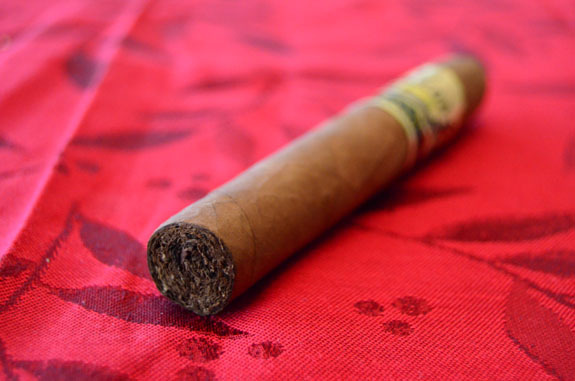 The cigar is producing a satisfying amount of thick, creamy smoke that is medium to full in flavor. So far, I am not feeling any nicotine. The burn-line is solid leaving behind a light gray ash that is holding easily to an inch. I am absolutely loving the creaminess of the smoke from this La Jugada Habano. As I make my way into the second third, the sweetness develops into a caramel flavor, the spice has toned down, and the bread-like notes are still in the flavor make-up . The flavors are very well balanced at this point and the burn-line is rock solid through the middle third. The smoke has become somewhat charred tasting so I am slowing my pace to see if it alleviates this flavor and brings back the enjoyable flavors from the first and second third. As I slow my roll, the dried fruit, mainly raisins, I picked up on off the foot aroma is now appearing in the profile and the caramel sweetness is still around but much more faint. This may sound odd but the finish of the smoke reminds me of the after taste of asparagus. A touch-up on one side of the wrapper was required in the final third. At the close of the cigar, I am feeling very little nicotine. 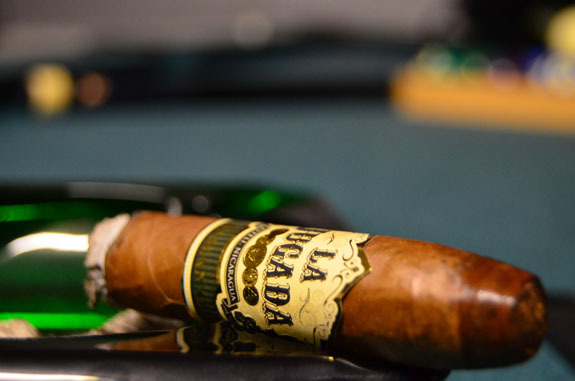 La Jugada Habano is another solid offering from Moya Ruiz Cigars. It never fails to surprise me the impact the wrapper has on the experience. While the internals (binder and filler) remain the same as the Prieto, the Ecuadorian Habano wrapper will take you on a completely different journey than its older brother. The Habano performed very well and delivered a spicy, creamy profile with cedar, caramel, and bread-like notes. The only down fall was the charred flavor in the final third. However, the charred notes were not encountered in the other sample. The strength was at the low end of medium and the flavors were medium/full. I highly recommend that you give this cigar a try if you enjoy a spicy, woodsy, somewhat sweet, bready profile. I am pretty sure you won’t be disappointed and you won’t break the bank either. And the winner of a full box of Romeo y Julieta – RyJ is….. Thank you to everyone who commented, liked our Facebook page, shared the contest on Facebook and/or Tweeted about the contest. We had an amazing turnout! And now for the winner, chosen at random….. Please do me a favor and email me your address and I will get these out ASAP! (jmhensley13 at gmail dot com). Let’s hear it for Jeremy’s new camera! 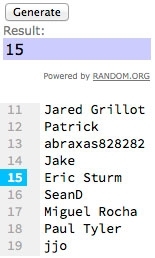 Also, thanks to everyone who entered and showed their support. We love each and everyone of you. Great work with the new camera! I did enjoy the Prieto, so I’ll have to pick one of these up if I come across it. And congrats to Eric! Bahhhhh one person off!!! lol. Congrats Eric! Great review as well Jeremy! Thank you for checking out the review. You and Danny are on a roll of producing great sticks! Keep it up.